Art is a great way to express yourself, to escape a stressful day, and to daydream. If you have been thinking about picking up a paint brush but have put it down because of the expense to get started on this new venture or hobby, maybe you can rethink this decision. Maybe you have ventured into quality art stores and were overwhelmed by all the choices and prices. Well, if you are just starting out, you do not need to start at the most expensive supplies. There are basic art supplies for beginners, that can get you started right away. Others may disagree, but I found the investment much less. 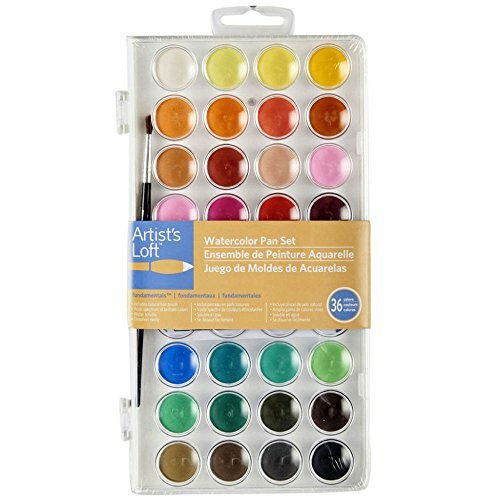 But if you want to try a watercolor, but not sure the type of paint you want to use, then it would be best to find a starter kit. I have found that shopping online offer great prices and stock for the beginner. Even the most professional artist out there was once a beginner. My beginner set included the basic colors and I mixed them together to create other colors. It helped me decide the type of artwork I wanted to do and then was able to add to this set bit by bit. I then discovered I loves a method called “Pen and Wash” which is drawing with an permanent ink and dip pen and then coloring it in. I only discovered this from trying different things and styles. You need to explore but on a budget! 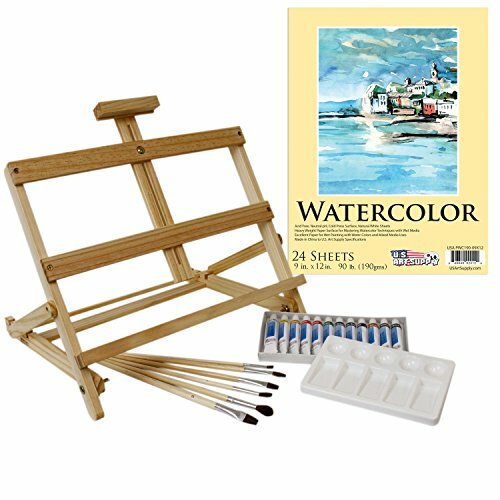 This one comes with tubes of paint that you can mix in the wells, as well as a portable easel, as leaning over a table is too hard on your back. It has everything to get started for under 30 dollars. You don’t need a fancy studio or loads of stock, just the place to do it. 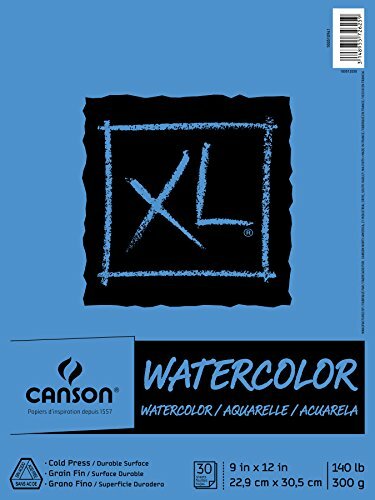 Once you have purchased your set, you can go on YouTube and search out watercolor artists and watch them at work to get an idea of how to use them. Or you could take a local class, but if you are not sure you want to commit to a class, then technology has done us a huge favor with You Tube. My personal favourite is Alan Owen, he is a British watercolor artist that puts on weekly shows to help everyone from beginners to professionals. He uses the cakes of color rather than the tubes, but you will find which you prefer from practice. I have included one of his videos here. His voice is soothing and totally no pressure. I simple enjoy watching him create on camera. This set is even cheaper, and I find if you are just starting out, you don’t want to be afraid of mistakes. You need to practice and have fun without worry how much you just spent on that paint or paper or brushes. You don’t need high end brushes when you are just starting out. You want to find your way without fear of using up your spending money. Just try it, and try different methods. Go to YouTube and find out how to use the supplies. Usually the brand of art supplies will have a website too that can help you get started. After you practice and have some fun and figure out your style, then you can concentrate on more targeted supplies. Don’t put the pressure on yourself to get the high end of everything, when you don’t even know if you will enjoy this craft. 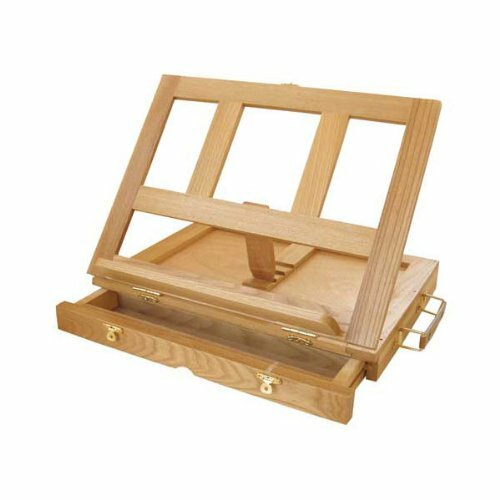 Once you have got started, even with the most basic of sets, and realize you want more of an angle when doing your artwork, these tabletop easels are perfect. 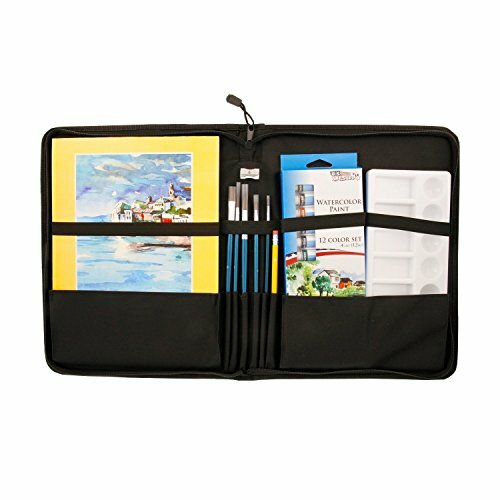 They are portable so you can go to any room, they have storage for your new supplies, and are adjustable to help your back and see your work unfold. Yes you can get high end easels to set out on that hilltop and paint the world, but for starting out, this is a great portable artist desk. Personally, this is my favourite. Everyone is different, but I love the portability of cake colors. They remind me of the painting sets from when I was a kid. These are higher quality, but without the price tag. Start playing with them, get in there and get started. All you need is water, a brush, paper and your imagination. You can get all the high end colors later. Just start mixing them to see what shows up. I find cleanup easier with the cake colors and I don’t have to take the lid off a tube! Others may prefer the depth of the tube colors. But by purchasing a starter set, your investment is not large. Once you figure out what you really love to do, then you can focus on more supplies. Quality doesn’t automatically mean expensive. As long as the paper is rated for watercolor then you can use it and set yourself free. This particular brand is my favourite. You can purchase it at most art supplies stores and craft stores such as Michaels, but you can also get good deals online. This paper is scored so that if you end up creating a masterpiece you are proud of, you can fold and tear off the holes from where it was in the book and matt and frame your masterpiece. Watercolor does not need a Top Coat for protection, but you should keep it out of direct sunlight. If you want to frame one of your best pieces, make sure it is dry and flat (learn how to flatten watercolor paper) then make sure and use a frame that as UV glass to protect it and hang it somewhere out of the sun and somewhere you can be proud. If you want to create a piece for framing, then try to stick to standard sizes that would fit in a matt and a affordable frame off the shelf at Wal-Mart or Home Sense or a frame you own. Framing can get very expensive if you need an odd size. Take your watercolor paper and measure out the borders and just don’t paint past them. I like to use painters tape to keep the edges clean. Enjoy your new venture, and you won’t be a beginner for long.